A lot of people may talk about riding off into the sunset into retirement, but Mayo Clinic rheumatologist Eric Matteson, M.D., actually did it. 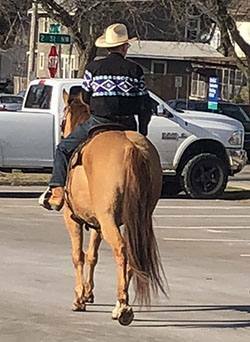 If you were near the Mayo Building in Rochester around sunset on April 23, then yes, you very much did see someone riding a horse down the street. 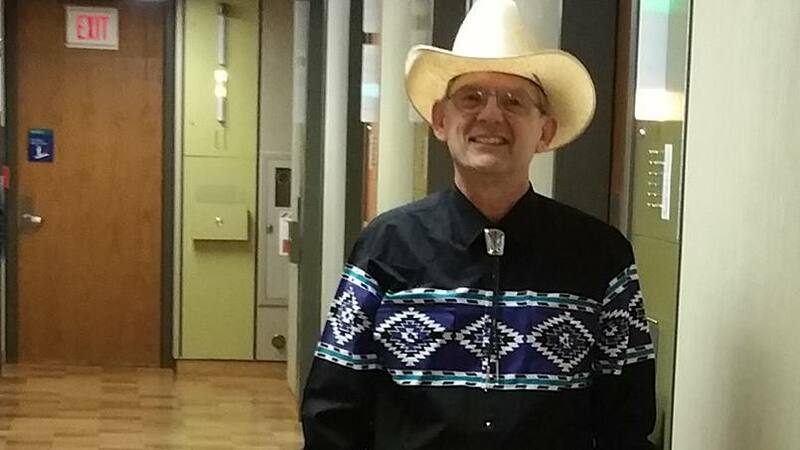 That someone was Eric Matteson, M.D., former chair of Mayo Clinic's Division of Rheumatology in Rochester, and he was bidding colleagues farewell in about the best way we can imagine. People may talk about "riding off into the sunset" once their working days are done. But Dr. Matteson actually did it — riding a real horse into a real southeast Minnesota sunset. And he tells us he'd been thinking about it for a while, too. "The idea first came up 20 years ago while I was talking to some friends who had horses," Dr. Matteson tells us. "I had joked that an ancestor of mine, Jimmy Baker, had been a star in the Buffalo Bill Cody Congress of Rough Riders and that while I'd never make a career on a horse myself, I thought it would be fun to finish on one." Lexie Davis, Eric Matteson, M.D., and his wife, Herta. As time went on, Dr. Matteson's friends sold their horses and the idea faded from his mind. It resurfaced, however, during his retirement celebration just before the big day. "Someone had asked me how I had envisioned my last day at Mayo, and I recalled the horse idea," Dr. Matteson says. "A colleague of mine, [physician assistant] Dan Schaffer, overheard that, and the next thing I knew he was arranging for horses to come to town." Schaffer rounded up help from another of Dr. Matteson's colleagues, clinical assistant and longtime horse owner Lexie Davis. Davis tells Rochester's KTTC-TV she was more than happy to (ahem) pony up and help make Dr. Matteson's retirement dream come true given everything he's done for others throughout his career. "He always has a smile on his face, he always has jokes, it's a pleasure to have worked with him, and if you're ever in a bad mood, he always brightens your day," she says. And while Dr. Matteson tells us that he'd wanted the event to be low-key and witnessed only by his Rheumatology colleagues, he says he's now glad that those colleagues invited a TV crew to ride along, so to speak. "It was a lot of fun, and I was amazed by how many people saw [the story]," he tells us. "Even patients and colleagues from all over the United States and Canada saw it. My wife's Facebook page got a lot of comments, too." Dr. Matteson tells KTTC it added up to one more memorable experience on top of the many he's enjoyed throughout his career at Mayo Clinic. "This has been the best experience of my life to have the opportunity to work at Mayo with the best people in the best place imaginable," he says. "I'll miss my patients, I'll miss my research, but I'll miss my colleagues most of all." 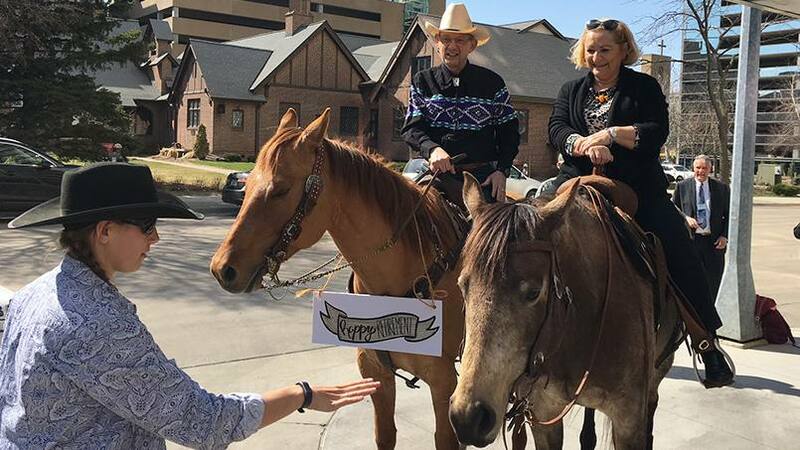 Saddle up for more of Dr. Matteson's horse-powered retirement story here. Then git along over to leave a comment below before using the handy social media tools atop this page to share this story with others. Learn more about the Division of Rheumatology.